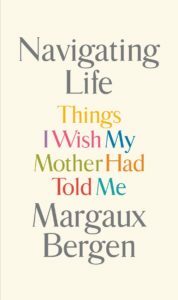 Heartbreakingly funny, wise, and resonantly true, Navigating Life has invaluable lessons for students of life of all ages. It will challenge you to lead a more meaningful life and to tackle the bumps along the way with grace, grit, style, and ingenuity. What the Blessings of a Skinned Knee did for the early years of parenting, Navigating Life does for the next, far more perilous chapter, when new graduates are cast out on the high seas and have to learn to swim and find their way by themselves. Available to buy on Amazon (US) and Amazon (UK). Listen to a Navigating Life preview on SoundCloud.